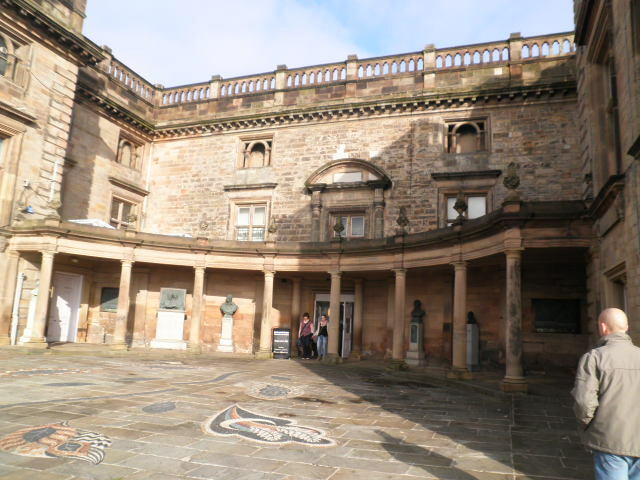 For Part 1 of this module I was required to visit an art gallery which at the time I was unable to do but was able to visit in the summer of 2015 Nottingham Castle and Art Gallery and this blog is in fact a re-write of the one I did at the time but for some reason did not publish or save. The original castle is believed to have been built around 1067 on the orders of the new king of England William the Conqueror. The design was a motte and bailey design with the castle enclosed by a wooden enclosure and the position chosen was Castle Rock which overlooked the city of Nottingham – William’s preferred choice of position was usually high ground as was common at the time. Subsequently during the reign of Henry II a century later the castle was extensively rebuilt with stone and after the death of the king a major battle took place there due to the argumentative nature of his two sons – Richard took position of the castle from his brother John after laying siege to it for a period of several days. This particular Richard is the infamous Richard the Lionheart. Later during the reign of Edward III in 1330 the castle was involved during the his battle for the throne and the tunnels underneath Castle Rock enabled Edward to enter the castle through an inn at its base – that inn Trip to Jerusalem is still there and a very popular public house to this day. Upon entering the castle Edward was able to arrest the lover of his mother Queen Isabella, one Roger Mortimer. It seems that Mortimer and his mother were responsible for the murder of Edward’s father and upon the arrest of this figure he was able to establish himself as the monarch. Mortimer met an untimely end at the gallows at Tyburn. Mortimer’s Hole is the passage which Edward took to arrest this man and can be seen. Just over a century later in 1485 Richard III left the castle for the battle of Bosworth – this famous battle lead to his death at the hands of Henry Tudor who was at the time 2nd Earl of Richmond and who subsequently became Henry VII. The castle came under the occupancy of the Parliamentarians in 1642 who successfully dealt with several Royalist assaults – Charles I had raised his standard outside of Nottingham Castle and hence the Civil War began. After the king was executed the commander of the Parliamentarians one John Hutchinson decided to demolish the remainder the of castle in 1651 so that it could not be used in battle again – the remnants of the medieval castle can be seen in the subterranean areas. Before I write of the next stage of this castle I cannot ignore the tales of the infamous Robin Hood for which Nottingham is so famous. First mention of this skilled archer and swordsman is in specific rhymes relating to him date from the early 15th century and I quote “Robyn Hode in scherewode stode” but the first recorded mention of him is in poems from the late 14th century by a man called Piers Plowman. There is much debate over whether Robin Hood actually lived or weather he is merely legend but if he did there is every chance he came to Nottingham Castle if he was arrested by the ‘villainous’ Sheriff of Nottingham. It is widely believed Robin Hood was a supporter of Richard the Lionheart so supposedly lived around the 12th Century in nearby Sherwood Forest. There is no question that the tales of Robin Hood are entwined very much with the history of Nottingham and the castle and within the current building there is understandably an exhibition in his honour – it is wonderfully done although I only managed a brief look during our visit to the gallery. In 1678 a Ducal palace was built by Henry Cavendish who was then the second Duke of Newcastle. By this period the monarchy had been restored (1660) and consequentially large houses were very much back in fashion. However during rioting in the city two centuries later caused by the Duke of Newcastle’s opposition to parliamentary reform the palace was burnt down leaving just the outer shell – there is an extensive and very interesting exhibition in the Castle about these riots. After a period of neglect lasting 40 years the castle was given to the Corporation of Nottingham on a 500 year lease and just 3 years later after extensive renovations were carried out it opened as a museum of fine art – what is incredible to think now is that it has been a centre of art in Nottingham for nearly 140 years. 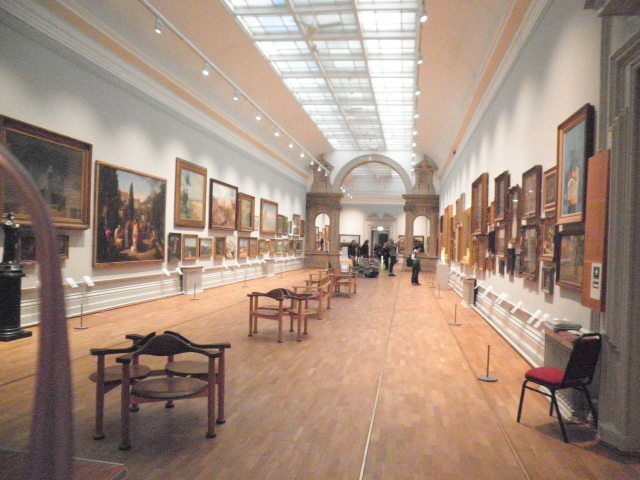 The gallery was the first municipal art gallery outside of London – and maybe this is why I was disappointed with the way the art is displayed currently. The castle is lucky to possess what is considered one of the finest collections of Wedgewood ceramics in the world which is displayed alongside silver and glass and this is something I would like to go back and have another look at as time was short on the day my fiance and myself visited. So now on to the art gallery itself. Sadly this is where I confess to being disappointed – not at the art on display but for the organisation and hanging of the art. As can be seen in my photograph the gallery is primarily in one area called the Long Gallery which is a beautiful large room and the works of art are displayed in a haphazard manner – works by the same artist are not together and two works which are both gold leaf on wood but several centuries apart in age are next to each other for instance. It feels that the gallery has almost been arranged on size of the works and how they look aesthetically on the walls rather in genres or even chronological order and this is where I feel personally this is a mistake particularly considering how long the gallery has been in existence. I also felt that considering that history the lighting of the paintings was very poorly done – having subsequently visited the Joseph Wright Gallery in Derby the pictures are more sympathetically lit with consideration to preservation due to their age and this is desperately lacking here particularly considering there are some medieval panels. Finally unfortunately the works of art seem to be bunched together in such a way the visitor is not able to see clearly some that are above eye level including some that are very small in size and combined with the lighting this meant the experience of the gallery was poor – you are not able to get a clear view due to reflections as many are behind glass. The disappoint of the gallery layout is due to the fact that there are some stunning and incredibly interesting works of art and they deserve to be seen in the best possible manner. As this is a re-written version of a lost post I was expecting to be able to re-load my photos and do the blog relatively quickly but on examination of my collection of images I realised there were many more than I had originally included that deserve to be mentioned. I guess the best work of art to mention first is this one attributed to John de Critz (1551/2 – 1642) of the Countess of Nottingham c. 1600 – oil on wood. John de Critz was of Dutch and Flemish origin and was brought to England by his parents as a young boy. 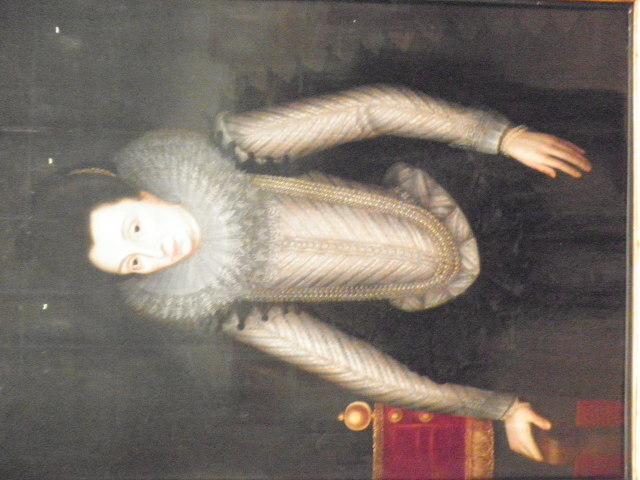 He later became an artist at the royal courts of James I and Charles I and as stated above the castle had clear connections to the monarchy and it is believed he painted this work of the Countess. The detail on the clothing is extraordinary and I managed to take some clear images for possible future reference. The style is very typical of the Baroque period and it is of a time when portraiture had become a valued profession. At the time of my visit I was studying the Renaissance and Baroque periods and subsequently found this painting by Cristofano Allori of Judith Holding the Head of Holofernes particularly fascinating. The painting was done in 1600 and is oil on canvas. This is a very striking painting and the rendering of the paint with the colours was incredible to see – the work is very typical of Allori with his richness of colour and depiction of form and I noted the exquisite texture of the clothing including the folds of the fabrics. 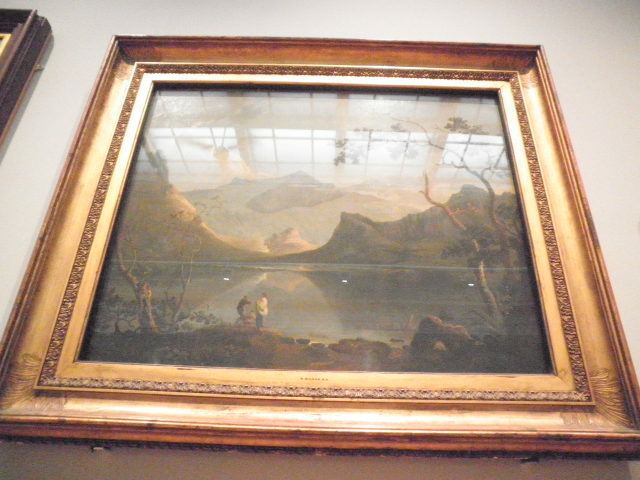 My point on the lighting and the ability to see the work of art clearly is made in this photograph as the painting is behind glass for protection but that also meant the light reflects badly as you try to view the work. Going along the gallery and finding the start of the chronological order I found this panel by Aretino Spinello (1350/1352-1410) and called Blessed Guard of Villamagna and St Mary Magdalen with St Catherine of Alexandria (1380-1390). The panel is tempera and gold leaf on wood and is typical of the period as with representatives of of holy figures being part of the Catholic iconography. 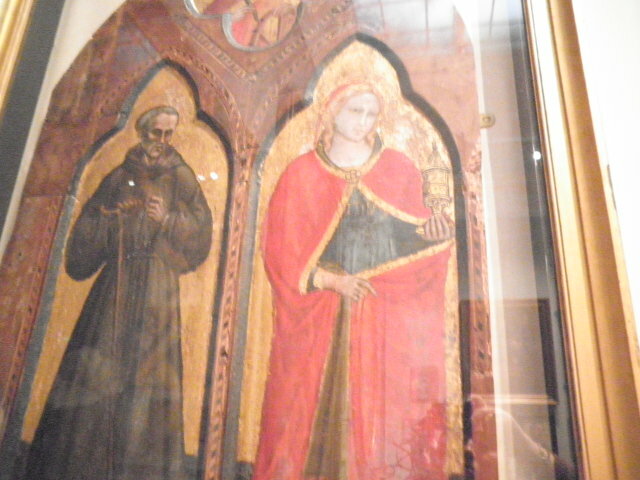 I really loved this piece and it was fabulous to see a work of art from the medieval period actually in person. A painting nearby was a little disconcerting as it is the same oil and gold leaf on wood but this time was painted around 1819 and called Virgin and Child and is by Carl Adolf Senff (1785-1863). 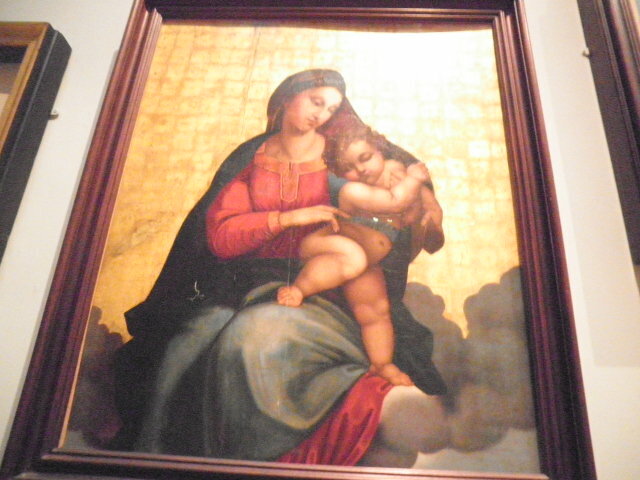 The panel is tempera and gold leaf on wood and is typical of Catholic iconography. There is an overall sense of movement and the figures appear idealized as opposed to natural – they have a spirituality in their rendering as opposed to the mortality of an earthly figure. When I checked the date of his art work I was slightly surprised as it very reminiscent of much early iconography works and almost doesn’t fit in with the period in which it was painted when history was taking its position in reason of thought – this was the Romantic period of the art world and the Industrial Revolution had begun but it made more sense when I discovered that Carl Adolf Senff was originally a theologian in Leipzig before becoming a painter. 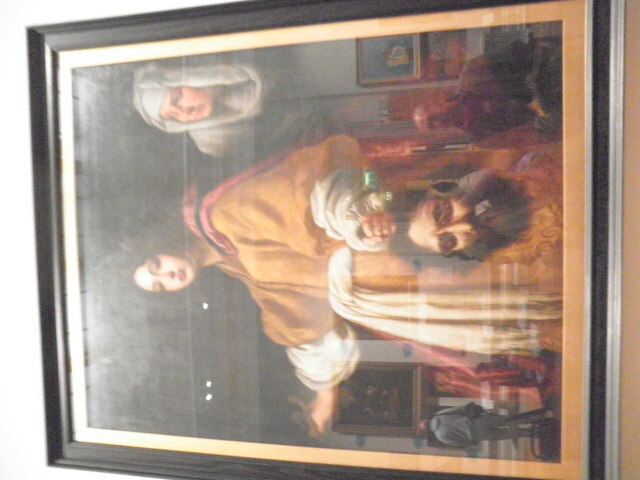 It is reasonable to assume that Senff remained intensely religious and was able to combine his skills with his devotion to the church in some of his art. 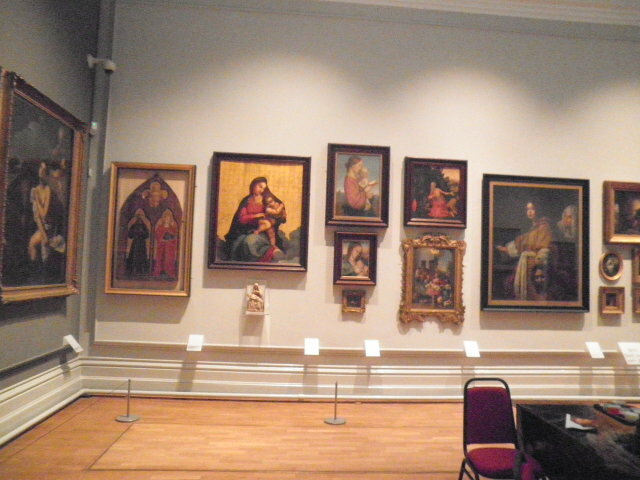 As I stated before the art is displayed in a slightly haphazard way and the two pieced directly above were placed next to each other despite being over 400 years apart – I can understand the thought that they are of similar style in the fact that they are iconography works but the periods are totally different. I realise I am jumping around with dates of works which is going to get confusing for any readers of this blog so I will put my images from this point in in much more of a chronological date order. Virgin and Child with St Joseph is dated around the 1500s by a follower of Joos van Cleve (c. 1464-c. 1540) and is oil on wood. Joos van Cleve was a master painter in Antwerp and he is well know for his religious paintings. The artist who painted this very much followed Joos van Cleve’s sensitivity of colour although the perspective is yet to be mastered. I do re-call spending several minutes looking at this piece of work such is the delicacy of the brushstrokes and the softness of the colours and the face of St Joseph has been done in such a way that he looks almost like a protective grandfather. 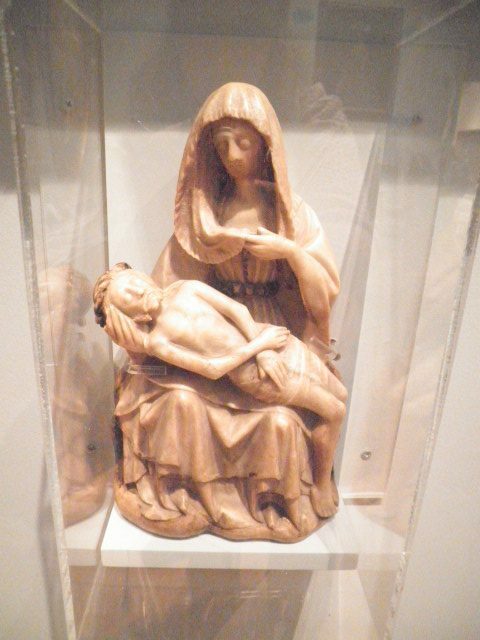 The Lamentation over the Dead Christ was carved around 1400 – 1450 and is of Nottingham alabaster. 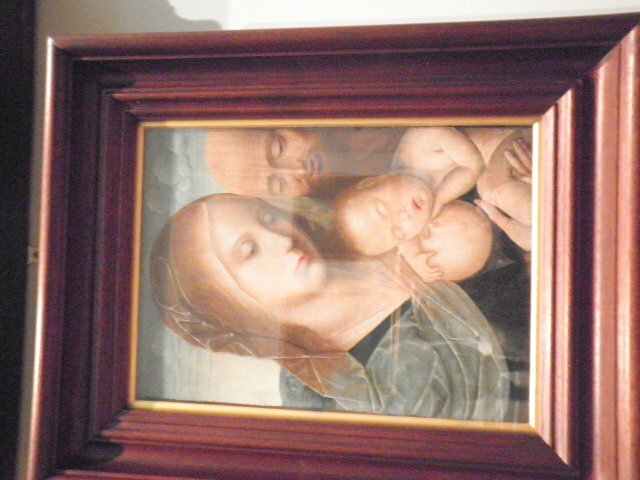 This is an early Renaissance piece and very typical of the time regarding the popularity of ecclesiastical sculpture and particularly of the Virgin Mary and child but in this case Jesus Christ is not seen as a baby but after his death. I am unsure about it on a personal level as I feel it is quite naive in its execution and the face of the woman, I presume it is the Virgin Mary, could be deemed Gothic in style in the modern sense of the word (and what I mean by that is slightly ghoulish). However the Gothic style was the preceding style to the Renaissance period and this sculpture is possibly on the cusp of the two. There is no information regarding the identification of the sculptor. Going forward to the 1600s this next photograph is part of a painting entitled A Dutch Party (c. 1620) by Dirk Hals (1591-1656) and oil on wood. Unfortunately due to the lighting in the gallery I was unable to get a clear photograph of the whole painting which is a shame because it was one of my favourites. Dirk Hals was the younger brother of Frans Hals and born in Haarlem in Holland. Dirk Hals is known for his colourful scenes of festivals and ballrooms and is use of colour creates a real vibrancy – I can see just from this small section of the work the use of complimentary colours of blues and oranges which bring the work to life along with strong contrasts in dark and light tones. The figures at the party are realistic in portrayal and this was very much part of the style of the Dutch Baroque period – this realism was a continuation of the early Netherlandish style. At this point I will state at the time I went to the gallery I was not a huge lover of Dutch paintings but this one by Dirk Hals really changed my mind. I had formerly thought of Dutch works of art as dark and sombre but this is one of live and vitality and I would love to get a small print of it. In a contrasting style but of the same period albeit 30 years later this painting of a Peasant Smoking in an Interior portrays peasant life in the Dutch Republic. The artist was David Teniers the Younger (1610-1690) who was born in Antwerp and became well known for his portrayal of peasant life. 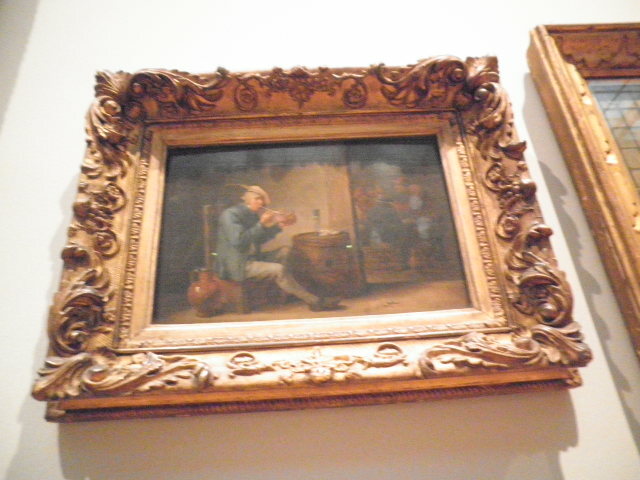 Even though the art work was too high for me to see clearly it portrays a very simple peasant man in the interior of his humble abode and like the image of the party above the figure is painted in a realistic style. The colour wheel is still that of blues and oranges albeit the brown shades and it is this that brings to life the composition albeit with much softer tones than the scene by Dirk Hals. There is a real sense of form and depth from what I could see and I would dearly love to be able to take a much closer view of this piece as the brushstrokes look to be very delicate and the glazes and layers of the oil paint done with considerable expertise. 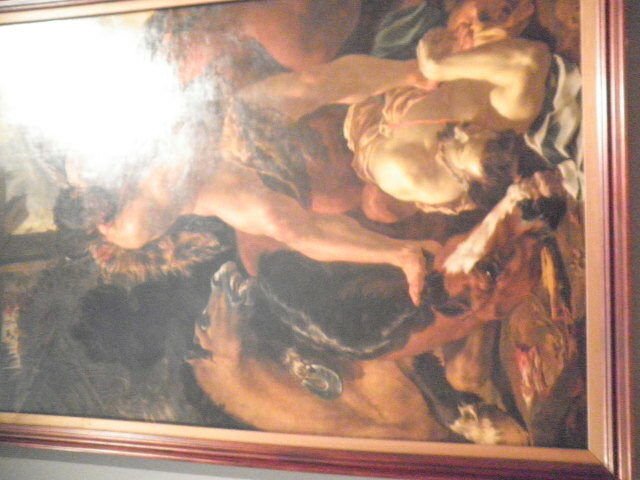 Hercules Vanquishing Diomedes (1638-42) by Charles le Brun (1619-1690) feels familiar territory with its composition based on Greek mythology so typical of the Baroque period. This painting was done for Cardinal Richelieu who was Chief Minister to King Louis XIII of France. Charles le Brun was later declared the greatest painter of all time by Louis XIV of France. I don’t mind admitting I just love this work! 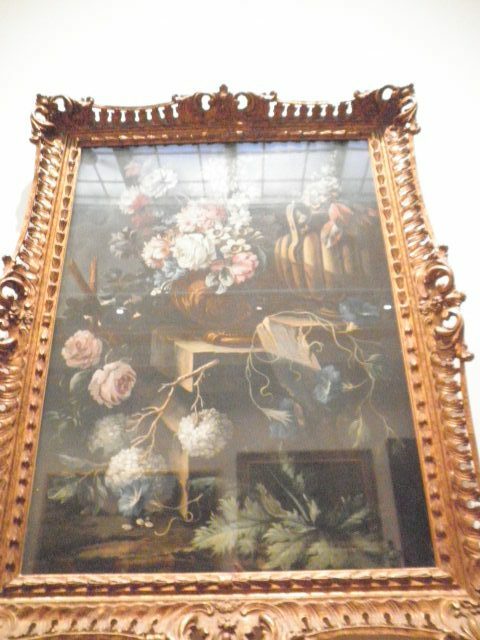 Flower Piece by Gasparo Lopez (1650 – 1732) I initially thought was a Dutch still life but it turned out to be by this Naples born artist who is best known for his portrayal of flowers. Even though my photograph is again not what I would like I decided to include it for the fact it is a still life and painted at a time when this genre was really beginning to flourish (I could have easily said ‘bloom’ at that point!!). Still life had really started to develop in the Netherlands but German and French painters also developed it. Spanish and Italian still life works do date from this period too which shows the spread of the techniques and fashions throughout Europe. The colours are delicately rendered on the flowers and there is a fragility about the blooms when you see the work in person which is further enhanced by the darker back ground hues – there is a definite contrast between dark and light reminiscent of the use of chiaroscuro in other works of the same period. Moving forward to c. 1765-7 Snowdon from Llyn Nantlle, North Wales was painted by Richard Wilson (1714-1787). I had not as yet come across Richard Wilson at the time I saw this painting but am happy I photographed it as it seems he was a successful 18th Century landscape painter. He was the son of a clergyman and had a classical education and family connections enabled him to make a good living as an artist – initially portraits but after studying in Rome for a considerable period he came back to England to concentrate on landscapes. This view of Snowdon is considered the best of his works based on the Welsh landscape despite being not topographically correct – it is the harmony of the forms and colours that make this so exquisite in execution. There are apparently alterations to size and scale but if you do not know the landscape then this is not something you would realise. 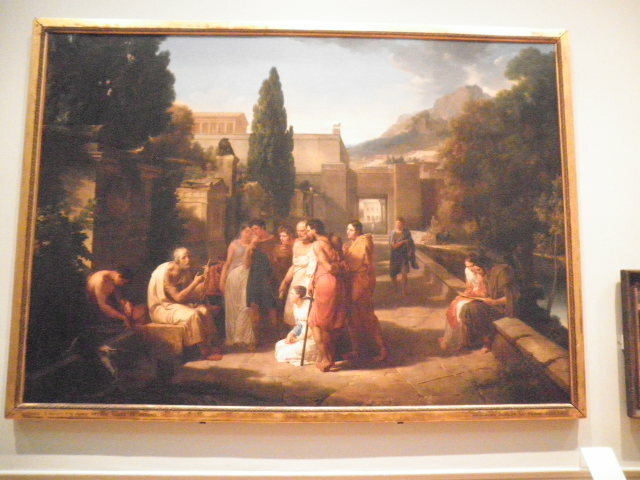 Homer Singing his Illiad at the Gate of Athens (1811) by Guillaume Lethiere (1760-1832) – oil on canvas. Guillaume Lethiere was a French Neoclassical painter and this image harks back to the Baroque period of images from Greek Mythology. What is interesting to note is how the techniques of perspective have been mastered and in my opinion improved upon since the earlier period. There is less idealism than I would expect from a mythological work and the figures are more realistic – idealism is a consequence of classicism in the fact that many classical figures of antiquity or mythology were portrayed in an idealistic manner due in part to not having the actual people in front of you. The people portrayed in this painting are standing in the classic still and calm poses and the composition is one of rectilinear composition. Celadon and Amelia in a Storm (1840-1849) was inspired by James Thompson’s poem ‘The Seasons’, Summer: Lovers in a Storm’ published in 1727. The work was painted by John Wood (1801-1870) and is oil on canvas. In keeping with the Realism style popular during the Victorian period the figures are perfectly portrayed but there is also an element of the romanticism of the preceding period with Celadon closely protecting his lover Amelia. There were several paintings done based on this poem and this is the least dramatic of those apparently. I love the depth of colour and the vibrant colours of Celadon’s clothes which contrast with the paler colours of Amelia’s dress which both in turn contrast with the dark sombre skies. 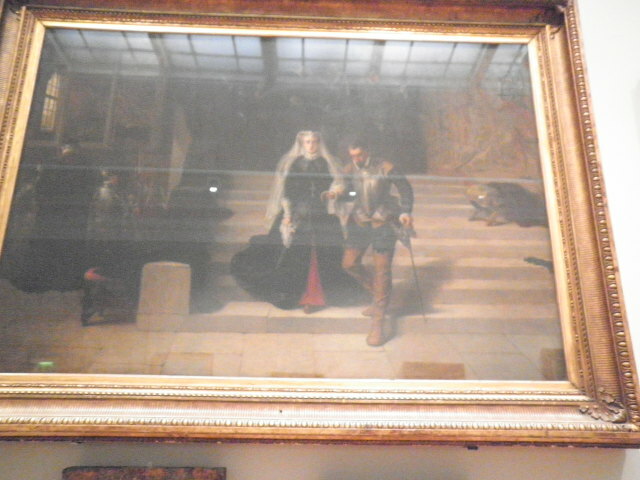 Mary, Queen of Scots being Led to her Execution (1871) by Lanslett John Potts (1837-1898) is another favourite of this exhibition – it is dramatic in its simplicity and realism and has a real sense of elegance and dignity of the Queen combined with a sense of foreboding at her forthcoming fate. The artist was born and raised in Nottinghamshire and was a specialist in historical paintings from the 16th to 19th centuries. 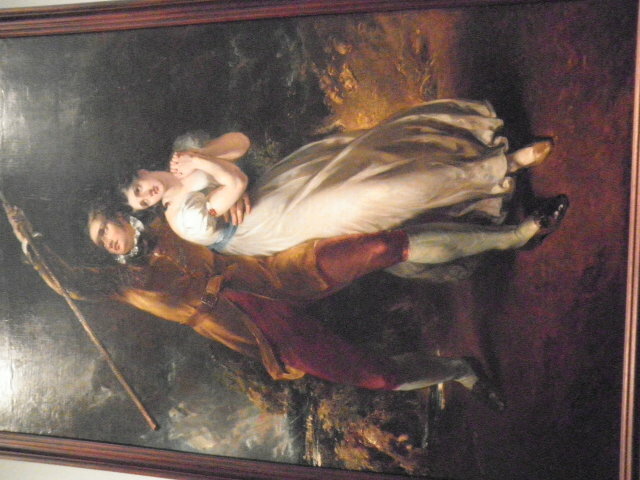 Biographical information speaks of his emotional narrative works and sentimental scenes from English literature that he did for middle class Victorians and I now feel the two different styles almost meet in this historical scene – it is without doubt full of emotion but at the same time depicts an image of the doomed Queen not often portrayed. The Rainbow (1862) by Henry Clarence Whaite (1828-1912). Oil on Canvas. This is another artist who is best known for his landscape paintings of the Welsh landscape and he captures the light and atmosphere of the valleys with incredible sensitivity of colour and form. His work was during the Romanticism period and my personal feeling on looking at this work is the word ‘romantic’ sums it up perfectly – the rainbow over the hills with the soft light and the family having a picnic in the foreground gives the impression of a blissful afternoon albeit knowing that rainbows come with the combination of sunshine and rain! James Hayllar (1829-1920) painted The Old Master in 1883 using oil on canvas. This artist was primarily a portrait painter along with figure subjects and landscapes and had trained at the Royal Academy where he often exhibited. 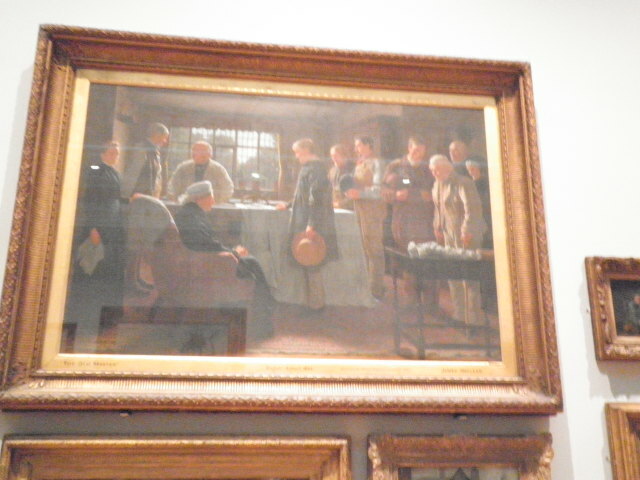 I like the composition of this painting as it appears to be a family or group paying their respects to an elderly master – this is an image that makes me wonder who the people are and the story around the composition. This painting is very much in keeping with the Realism style of the period and is so realistic that it almost has a photographic quality about it. I simply cannot resist the inclusion of An Oyster Supper (1882) by Horatio H Couldery (1832-1910). Oil on Canvas. 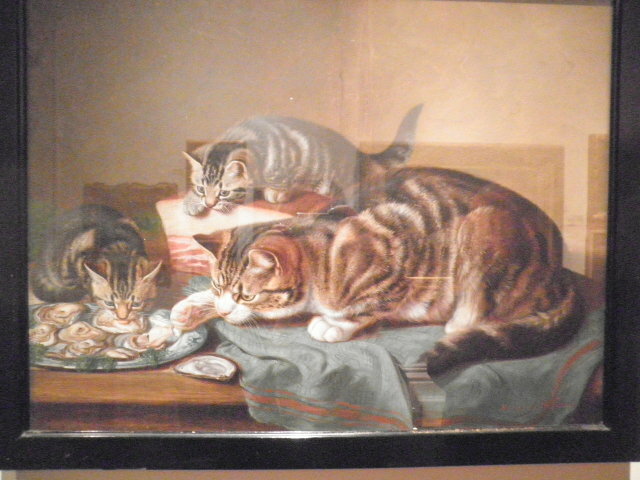 This is a painting that I am purposefully decided not to research the artist and to simply enjoy the scene of 3 contented cats enjoying an oyster supper – oysters at the time were cheap and plentiful and so this may have been a common scene at a time where tinned or dried cat food simply did not exist and as I look out into the garden as I type this I can imagine my own two feline friends would happily give up their biscuits for such a tasty treat as those oysters! The scene is beautifully composed and the expressions on the cat’s faces are perfectly captured by an artist who clearly had studied them at length and was a skilled animal painter. The above works are just an example of those in the gallery and unfortunately my images of the 20th century works are not clear enough to reproduce due to corruption of my camera card. However at some point during 2017 I will be paying Nottingham Castle another visit and will do a blog on my next course concentrating specifically on these pieces along with any 21st century works by contemporary artists. National Museums Liverpool. 2016. Artwork highlights – ‘Snowden from Llyn Nantlle, 1765, by Richard Wilson [online]. [Date Accessed: October 2016]. 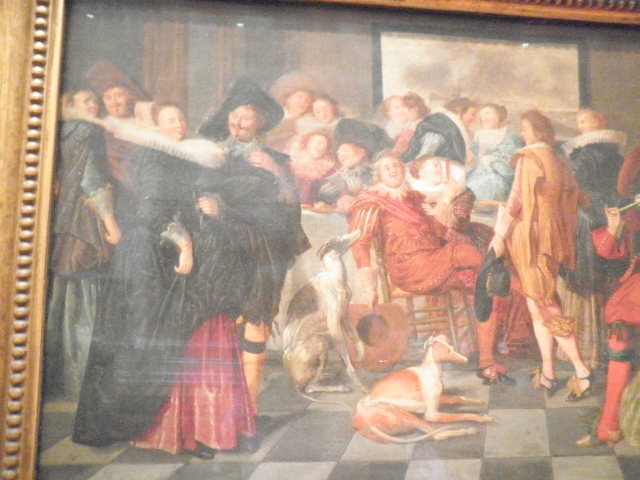 This entry was posted in Exhibitions & Books, Research & Reflection, Visits and tagged Aretino Spinello, Carl Adolf Senff, Charles le Brun, Cristofano Allori, David Teniers, Dirk Hals, Gasparo Lopez, Guillaume Lethiere, Henry Cavendish, James Hayllar, John de Critz, John Wood, Joos van Cleve, Joseph Wright, Lanslett John Potts, Llyn Nantlle, Neoclassical, Nottingham Castle. Bookmark the permalink.